Kansas revenue has dropped dramatically and no longer comes close to covering expenses. Standard & Poor’s and Moody’s have downgraded the state’s bond rating because the gap between revenue and expense has grown very wide following the implementation of Gov. Sam Brownback’s tax plan. Under the governor’s tax policy, what happens if Kansas only maintains current spending levels, adding just enough each year to cover growing bills for a few things that must be paid (such as Medicaid)? Kansas Legislative Research Department (KLRD) estimates show that within five years, the state bank balance would be $1.284 billion below zero. But the state is not allowed to go in the hole. Something must give. The gap will have to be closed. 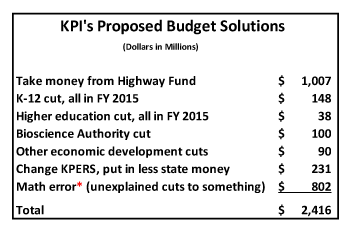 The Kansas Policy Institute (KPI) believes they have an answer in a recently issued five-year budget proposal. Pay attention, because it provides one example of what the governor’s tax policy may mean for the future, and given KPI’s close ties to the governor, this plan may be what he intends. Using the $1.284 billion below zero estimate from KLRD as a starting point, KPI advocates both revenue and expenditure changes over a 5-year period to get to a positive $1.131 billion balance. That’s a $2.416 billion swing. The chart at right shows how they do it. And what happens for public education and higher education if there indeed is a willingness to take a billion from the Highway Fund? In the KPI plan, public education gets a $148 million cut in state funding this fiscal year, higher education gets a $38 million cut in this fiscal year, and then they both go nowhere. Stuck. That’s how bad the budget outlook is. A billion dollars out of the Highway Fund and the associated transportation cutbacks do not yield new investment in education or anything else. It just props up a broken State General Fund. And then there is the matter of the math error. (*See below.) Another $802 million must be cut from somewhere — education, state employees, prison system, etc. — to arrive at the balance claimed by KPI. And that’s in KPI’s optimistic scenario, which has revenue growing by $321 million in FY 2015. If, in the likely event that revenue comes in lower, more unspecified cuts would have to be applied in addition to the $802 million. 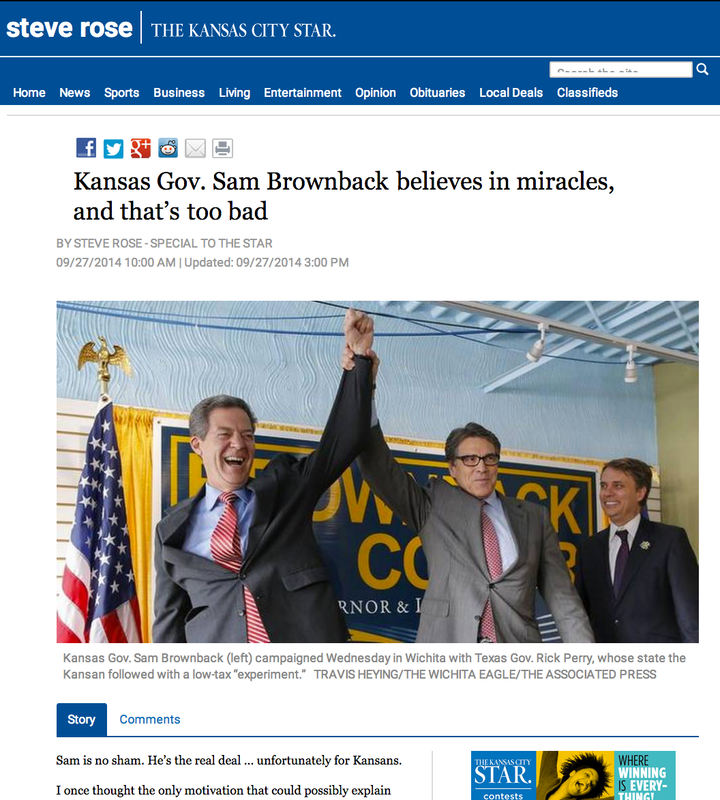 Kansas public education, state universities, Highway Fund supporters, and the unnamed recipients of an $802 million cut...it looks like you are the “beneficiaries” of the Kansas fiscal experiment. * The KLRD model can be used to show that the ending balance would be $1.284 billion below zero in five years without adjustments. But remember, the balance is not allowed to go below zero, so in the KLRD model, spending is reduced enough each year to get to a zero balance. KPI starts its calculations from the spending assumptions in the KLRD profile and fails to identify $802 million in cuts that in the KLRD model are assumed to already have been made, somewhere.